I spent last week in Las Vegas at the Consumer Electronics Show (CES) along with 170,000 others, making this the biggest show ever. Tens of thousands of new products were displayed by 3,600 exhibitors spread over 2.2 million square feet of exhibit space, primarily at two huge convention centers, Las Vegas Convention Center and the Sands. Of course, it’s not possible to see everything, even if you had a couple of months, let alone a few days. Moving from one center to another, about a mile apart, took about an hour, counting wait lines for the taxi and bumper-to-bumper traffic. 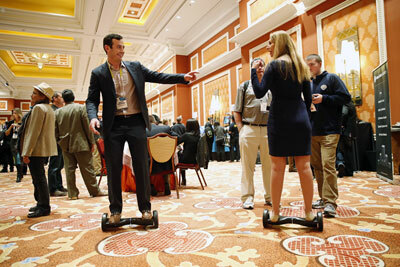 In speaking with many of the attendees, we realized that the best way to see CES is to stay home and follow the gadget blogs on the Internet, such as The Verge and Engadget. Nevertheless, by being there, it’s possible to get a flavor of the consumer electronics industry. There was great excitement and optimism, buoyed by the strong economy as well as the creativity and innovation from so many of the small startups exhibiting. It seemed like a high-tech gold rush. Checking out the new products from these small startups is much more interesting than seeing more TVs, phones, routers and computers from the large multinational corporations. But I noticed great naiveté in some of these entrepreneurs, many from Europe and Asia. So many think that reaching success consists of exhibiting at CES, running a Kickstarter campaign, going to China to build the product, then selling it on Amazon. As a result, many of these companies will be gone next year, because they fail to have adequate capital to promote and distribute their products, which often costs more than everything that came before. As for new products, I found hundreds of smartwatches and bracelets that can send you reminders or measure your pulse, but few that are distinguishable from each other. But as with other categories, there are outlier products that try to be different. Hyundai introduced a smartwatch that lets you unlock your door or start your engine with the press of a button. Why this is better than a key fob remains a mystery. It seems to be a silly idea, but you’ll likely see all their competitors jump on board mindlessly. 3-D printers were in abundance; some looked like sophisticated toys that let your kids create 3-D objects of designs they create on the computer. One interesting application being used by one company measures you for custom ear molds for earbuds and builds them on the spot using a 3-D printer. Drones were in plentiful supply from dozens of companies. They come in all sizes, all remotely controlled. 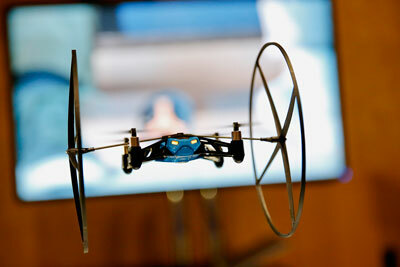 Most were designed either as a toy or, in a few cases, with a camera to create aerial photos. This is a burgeoning category that was barely visible at last year’s CES. But pity the person who wants to buy one. They are all so similar to one another that I don’t know how anyone could decide which one to choose. Accessories were everywhere with one huge hall devoted just to those for Apple products. Typo, a company begun by “American Idol” host Ryan Seacrest, showed a $100 iPhone 6 case with a Blackberry-like keyboard extending from the bottom. There were many battery cases for the new iPhone 6, including a clever design from Esorun with a built-in stand for $70. Transportation was another big category here; everything from Toyota’s hydrogen car to motorized skateboards and roller skates. While walking down one aisle, an attractive model whizzed by me riding a $995 Hovertrax, a small platform with wheels at each end that’s controlled by how she moved. It looked a little dangerous, zipping around at 8 mph with nothing to hold on to. The Hovertrax, originally a Kickstarter project, is controlled much like a Segway, by leaning forward to go forward, leaning back to go backward, and standing straight up to stop. Unlike the Segway this is extremely lightweight and can be carried in one hand. A few minutes later, I passed two other booths with similar products. Many automotive companies had some of their new models with new tech capabilities on display. Primary among them were always-on connectivity to the Web using a built-in cellular device, most with a monthly fee to Verizon or AT&T. There was much discussion of self-driving vehicles, which technically are feasible, but still need government approval. 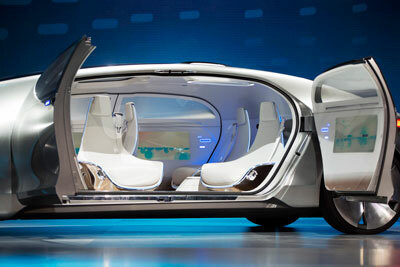 Mercedes showed a concept car with a living room-like interior and no visible controls. Harman, which makes many of the audio systems for automotive companies, showed technology that allows some passengers to listen to music while others can make a call within a cone of silence. I don’t know if they can do the opposite — eliminate the noise of screaming kids. Internet of Things is a new industry term referring to devices perpetually connected to the Internet, but it’s being taken to the extreme with Samsung’s president saying that in five years everything they make will have a connection, including humidifiers and dryers. It’s hard enough now to stay connected, but imagine needing to do this with hundreds of devices in your home — and needing to replace batteries on so many devices! Ooma, the maker of Internet phones, announced that it will now connect with a Nest thermostat and smoke detector, and its phone will call you when the alarm goes off, wherever you are. This is an example of the efforts of many companies to create the connected home. Even a window company joined the craze, building sensors into its products. And there were some innovative products for the kitchen. Drop’s Connected Scale works with its Drop Kitchen app to take you through recipes, ensuring you add the proper amount of ingredients as you adjust for the number of servings. ($99, getdrop.com). The Anova Precision Cooker at $179 lets you turn any pot into a sous-vide cooker, a method of cooking food sealed in airtight plastic bags in a water bath. This popular product wirelessly connects to your smartphone, allowing you to cook your meal with the touch of a button. I’m now ready to return home, with a bag of brochures, a few giveaway samples, and the smoke-infused clothes from walking through the casinos. Next year I hope to follow CES on the blogs, instead. One word of advice to CEA, the consumer association that runs CES: If you’re putting on a high-tech show, how about giving your attendees technology tools that work. CES’ app was bug-ridden and didn’t accept the password you registered with. You could click on a link, asking to chat for help, but the 70-minute wait time was even longer than most cab lines. And one of the biggest issues of CES — long, long cab lines — could have been alleviated with Uber, today’s technology solution but, not surprisingly, it’s banned in Nevada.